After Dracula rises and takes the Frankenstein Monster with him, Abbott & Costello hit the road as they’re accused of stealing the exhibits from the House of Horrors! 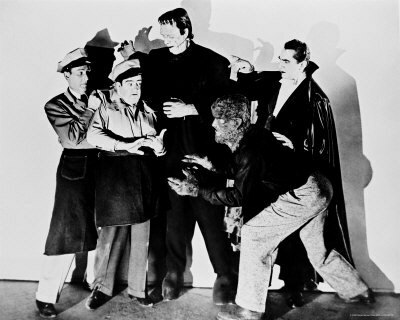 Talbot leads them on a quest to stop Dracula and the Monster with Doctor Sandra (Lenore Aubret), Insurance Investigator Joan (Jane Randolph) and the good Professor Stevens (Charles Bradstreet), Abbott and Costello are trying to lay low while clearing their names, with Costello trying to prove to Abbott that the monsters are in fact real. With the the well-known cast of Monster acting legends and the comedy star power of Abbott and Costello, the film is a classic that I first enjoyed as a kid. Today I still find it just as enjoyable as I did all those years ago when my Mom introduced me to the film one day at a Blockbuster Video. So looking for a good Halloween movie that you can share with the kids? Abbott & Costello Meet Frankenstein is sure to be a hit in your household for young and old alike. So check it out on DVD, there’s multiple copies available in different Abbott and Costello collections as well as the film by itself, or you Netflix fans out there can watch it on Instant like I did to refresh my memory. Just remember, if you get too scared and you’re by yourself, it’s OK to yell “ABBOOOOTTT!” and run out of the room. PETER loves Halloween movies and is sure by the end of the month, he’ll probably have told you about every single movie and TV episode that is Halloween themed that he loves.